Starbeard: Now see... I asks me-self, what kind of misbegotten son of a snake and a carrion would track down my untraceable path, steal me egg from my most paranoid and heavily guarded foe, and capture an entire crew of me men? What kind of deranged knave would have such a fervent death wish? And then, like a space albatross screeching in the solar winds, the answer just came to me: Katticus Attison. Saffron: I got this, Katty. I speak pirate. (switches to pirate) ARGH you scurvy dog. Stand and deliver the dragon eggs, or else we’ll have you keelhauled till you beg for the sweet embrace of Davy Jones’s locker. Starbeard: And who might you be? Saffron: I be Saffron. Salvation of honest voyagers, scourge of maggot ridden pirates, and doom of land lubbing dragon knappers. Now I won’t be asking ye again, hand over the dragon eggs, Starbeard! Starbeard: Starbeard? Are you the buzzing bilge rat what changed me name in all the systems’ databases? Saffron: It’s a better name than you deserve! Agent Katticus: Starbeard. As you can see, Saffron and I have captured your men. We’re willing to exchange them for the two remaining eggs. Starbeard: Ha! Trade power over the galaxies for a few measly men? I make a member of me crew walk the plank every other Tuesday for me own amusement. What makes you think I’d care a hardtack for any of them, much less pay for their return? Agent Katticus: But these aren’t just any crew members, are they? The egg is priceless, and yet you intrusted these men to steal it back for you. If you trusted them enough to hand untold power over to you, I wonder what else you trusted them with. Detective Connis. Detective Urswin. Detective Connis and Detective Urswin: Sir! Agent Katticus: Transport these men to the interrogation rooms. I expect a report to central command as long as the rings of Satrayus. Detective Connis and Detective Urswin: Yes, sir! Agent Katticus: Your move, Starbeard. Starbeard: Either I surrender the eggs, or me men spill their guts on everything they know about me? Let’s see here, between those two options, I think I’ll blow your ship out the star system. Agent Katticus: Not before we relay everything we know about you to Central Command! Captain Adam: (aside) Eh, Special Agent, for most of us here aboard the LK701, death is a rather permanent state. Agent Katticus: The choice is yours Starbeard. Starbeard: You will never, I repeat, NEVER, get these eggs. Agent Katticus: We’ll see about that. Leckie, cut transmission. Agent Katticus: Activate cloaking mechanism. Leckie: No such mechanism is available, Special Agent. Detective Connis: We’re a police station. We WANT people to find us. Why would we ever install a cloaking mechanism? Agent Katticus: I naturally assumed you’d have one in case of special occasions such as THE UNIVERSE’S DEADLIEST PIRATE THREATENING TO DISINTEGRATE US ALL. When I say it out loud, I realize how remote the possibility must be were it any other day. I apologize. Captain Adam: I admit we have not planned for this eventuality. Detective Urswin: (loud whispers) Somebody save them. Saffron: So what about this Oris character? Agent Katticus: WHAT ABOUT ORIS?! Saffron: You promised you’d tell me about him if I did what you said. And I followed orders like a boss! Well, like an employee. You know what I mean. Agent Katticus: Permission to discuss my personal life when we’re not in mortal danger of being blown up? Saffron: Ugh, fine. But I reserve the right to demand the story if things get too boring. Agent Katticus: Agreed. Sergeant Stanistem. Meet me in the engine room and we’ll try to rig up some sort of temporary cloaking mechanism. Agent Katticus: Captain Bradimov, I’ll meet you in the interrogation rooms when the task is complete, but please start without me. Captain Adam: Come on, crew. Let’s show the Special Agent what a small police station can do! Detective Connis: What’s our strategy, Captain? Captain Adam: First we separate them so we can play them off each other. Captain Urswin: Already done, Captain. Captain Adam: Good work, detective. Now let’s partner up. Saffron: So we’re doing this good cop bad cop? Captain Adam: We’re all good cops here, Guest Saffron. Cadet, you’re with me. Pay close attention to my techniques, this is a valuable learning experience. Captain Adam: Detective Urswin, you’re with Leckie. Captain Adam: Guest Saffron, you’re with Detective Connis. Detective Connis: Captain, I object! Captain Adam: No time for discussions. Good luck, crew! Detective Connis: Just… just stay quiet and try to look menacing. Leave the questioning to me. Saffron: Wouldn’t it be better if you played bad cop? Saffron: No, no, no, it’s strategy! You act all scary, like you could blow at any minute, and I act all nice, like I’m holding you back. Saffron: Good cop, bad cop! Detective Connis: Okay, then I’ll be “bad cop” as you suggest. Saffron: What up, pirate? I’m Saffron and I’ll be your interrogator today. This is Detective Connis. She wants your rearrange your insides. But don’t worry, I won’t let her. (loud whisper) Hey Connie, describe how you wanna rearrange his insides. Detective Connis: (loud whisper) I’m not allowed to threaten physical violence. Saffron: What? Then how were you planning to be bad cop? Threaten to tattle to his mom? Detective Connis: I thought we’d threaten to tell Starbeard he told us everything anyway, or maybe advocate for a harsher sentence unless he helps us. Saffron: Can’t you at least flip a table for me? Pirate 2: You lasses need a moment? Pirate 2: And here I thought ye wanted me to talk? Pirate 2: And what do you want me to talk about? My ninth birthday party? Detective Connis: Ask more direct questions! Saffron: Stop criticizing me, it’s my first time! Pirate 2: Shut up or talk? Saffron: That’s it, no more good fairy! Saffron: Oh relax, you’ve seen me do magic before. Detective Connis: (panicked) There’s these... legends on my planet. From pre-contact times. Of these winged creatures of pure chaos, who tear at the fabric of reality and weave pandemonium in its place. Leckie: Detective Connis. Your heart rate and blood pressure are reading as inordinately high. Please return to your quarters and Special Agent Katticus Attison will take your place shortly. Detective Connis: Yeah, yeah… that sounds good. Can I have my smoking caffeine back? Saffron: Just you and me now froggy boy. I guess you want to be turned back into a pirate, huh? I hate to tell you this, but curse breaking is really, really tricky. Saffron: Chill! I know some mermaids who have a thing for frogs. They also love to eat land creatures. Are frogs land creatures or water creatures? Saffron: I guess both? So the chances are 50/50. Not bad, right? Saffron: I could try it myself. I do know how to undo my own magic of course, but it’s just so tiring, I think I’ll just pass you along back to my world and..
Pirate 2: ribbit! Ribbit! Ribbit! Agent Katticus: WHAT IS GOING ON? Saffron: Katty here is a witness, you scallywag pollywog. If you lie to us or hold out on anything, you’re going back to froggy form! Agent Katticus: Uh, yes. Cooperate or remain amphibian. Pirate 2: (panting) Alright, Alright, here’s everything I know about Starbeard. He’s headed for… *deep breath* Scourgerus. Agent Katticus: The pirate planet? I thought it was just an urban myth? Pirate 2: It’s *cough* it’s as real as… I don’t know what’s real anymore. Saffron: My work here is done. Just give me a condensed version when you’re finished, okay Katty? Saffron: Phew! Interrogation is hard work! Leckie, I need to unwind. Can you play some Thin White Duke music? Leckie: No records of any artist by that name. Saffron: WHAT?! Oh right, I’m in outer space land. You poor, poor people. Can you download some from my own world? Leckie: Special Agent Katticus Attison is currently using all our interdimensional bandwidth to download more episodes of Star Crossers. Saffron: Ugh. Got anything local for me to rock to? Leckie: Ziggy Stardust is a very popular musician and shows high probability for matching your musical predilections. Saffron: Okay, I have my headphones on, let’s hear it. Saffron: .... Wait, Leckie. This is the Thin White Duke. Leckie: No Guest Saffron, it is Ziggy Stardust. Saffron: No, it’s the Duke, I heard this same exact song a thousand times before. Can you pull up a picture of Ziggy Stardust? Cadet Caffree: And so am I! Saffron: Aah! You again? Aren’t you supposed to be with the Captain? Cadet Caffree: Captain Bradimov asked me to leave. He said my incessant questioning of the pirates was bordering on cruel and unusual. Peri: Who am I talking to? Saffron: He’s like their Tristan. Only a hundred times worse. Peri: Saff, Mrs. Scorchington wants me to deliver an urgent message to you. Cadet Caffree: Is Peri a fairy like you? Or is she a human? You said you have humans on your world right? What are they like? Saffron: Ignore him. What’s the message? Peri: Mrs. Scorchington says that she’s very pleased that you rescued one of her eggs, so now she’s only going to burn down two thirds of our world. She says since you were the one who found the egg, she wants you to pick which third survives. Saffron: Make sure it’s the third with the kebab place in it! Cadet Caffree: Can humans in your dimension do magic? Do they have their own country? Or are they all over the place? If yes, do they have their own culture and language or do they have several cultures and languages like here? Peri: What? Yeah, we have humans. For now, at least. They’re not very fire-proof. 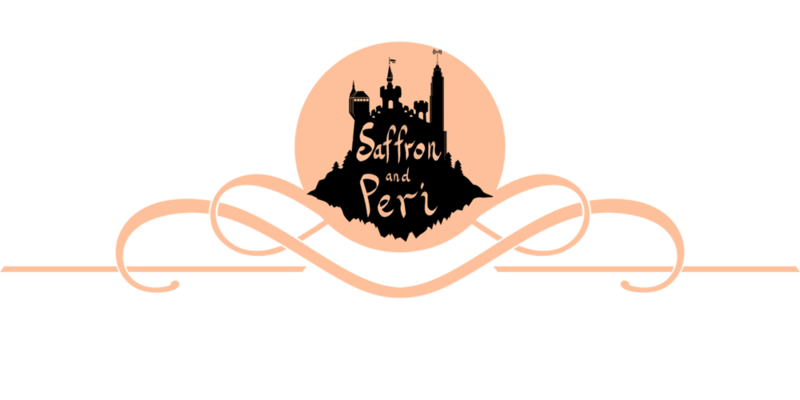 Saffron: Relax Peri, I’m sure Katty and I will get those eggs in no time! But speaking of fire-proof, the Djinn Kingdom should be okay, right? Can you ask your mom if she has some spare rooms? Cadet Caffree: Do you have a foreign exchange program in your world? Are there any restrictions to extra-dimensional beings? If not, where can I apply? What kind of qualifications would I need? Saffron: CAREFREE! WOULD YOU GET OUT OF HERE? Cadet Caffree : Oh. Yes. Sorry. Saffron: You be nice to me! I’m all alone in a strange dimension and the food here is terrible. I can only magic natural, unrefined sugar, and you know how I prefer the processed stuff! Peri: Sorry, I’ve just been stressed lately. I’ve got stuff to deal with at the Academy, new goblins to train, and an angry dragon mom breathing hot flames down my neck. And just when I thought my day couldn’t get any worse, Starbeard threatens to blow you out of the sky! Saffron: It’s just your basic villain speech, Per. The baddy makes some grandiose threat, runs back to his lair, then sets a trap for the heroes to foil. It happens at least once a season on Star Crossers. Peri: Heh, yeah. You’re life’s been a lot like an episode of Star Crossers lately, huh? Saffron: Totally! I got the sci-fi aesthetics, I got the ship full of freaky alien characters, and I got the really intense love triangle. Saffron: The Captain has old fashioned charm and who can resist a man in uniform? But the special agent is all mysterious and fascinating. How will I ever decide? Saffron: Just a sec, Per, I’m getting a message from besotted admirer number 2, I asked him for a sparknotes version of…. Uh oh, I don’t like the looks of this. Saffron: Katty, what’s code infa-red mean? Agent Katticus: It means mutiny, RUN! Saffron: Okay everybody. Observe. *slide noise* The Thin White duke *slide noise* Ziggy Stardust *Slide noise* The Duke *slide noise* Ziggy. Does nobody else see this?? Captain Adam: I just don’t see it. Saffron: Katty, I’m sure you of all people know something about it.